Ready to buy more books for fabulous prices? And see the rededication of the first mural ever to grace the outside of any Chicago Public Library branch? On Saturday, September 16th, the Bezazian Branch Library will hold its second book sale of the year, with hundreds of books at rock-bottom prices, between 10am and 2pm. But it's also bringing back some of its history in its 60th year, with the rededication of The Sea of Knowledge, its mural that dates back to 1974 and has been painstakingly revived in recent weeks. Both the original artist and the man who restored it will be in attendance. 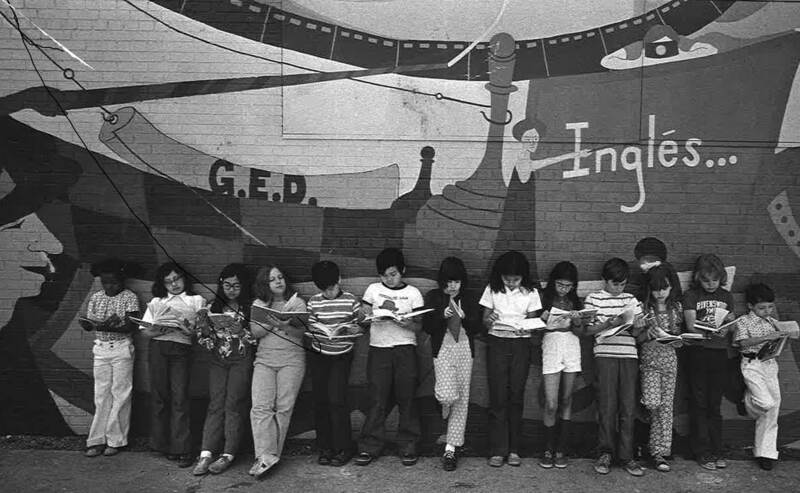 "As we continue our year-long celebration of our 60 years of service to the Uptown community, we invite you to a very special event on Saturday, September 16 at 11:00 a.m.
After decades of deterioration, we were finally able to have our 1974 mural revitalized. Archival research shows that it is the first on a Chicago Public Library building. Artist Tony Passero lovingly matched paint, deciphered images and recreated lost parts of the mural, which was originally created by artist Janis Pozzi-Johnson with a team of teens from a local community organization. Ms. Pozzi-Johnson will be on hand for the rededication. The mural, entitled The Sea of Knowledge, celebrates the rich diversity that is Uptown. This project was made possible through the generous support of Uptown United (SSA #34) and 46th Ward Alderman James Cappleman’s office and the efforts of the Friends of Bezazian. Please join us in celebrating the renewal of an iconic piece of Uptown art that will be enjoyed again for, hopefully another 40+ years. Concurrent with the dedication is a Friends booksale. Come browse, support their great work, and join the Friends of Bezazian."